10% Discount for new customers. We Pat test all appliances for all types of businesses, inspection includes checking inside the plug and cables for defects. We provide proper testing to the IET code of practice providing Pat Testing ( Portable Appliance Testing ) to all businesses including Landlords, Shops, Hotels, Hairdressers, Offices, Factories, Nursing Homes, Solicitors, Schools, DJ Equipment etc. Appliance Testing ensures you are complying with your Health and Safety responsibilities and it validates your buildings insurance. Pat tests can be done while your business is open or an out of hours service is also available to minimize business disruption. We work to the IET Code Of Practice, Competent Pass certified accredited City and Guilds engineer. Pat Testing For Bradford and West Yorkshire Areas . Great Service Bringing our Customers back Year after Year. No VAT On Our Prices. DBS Checked engineer. 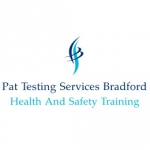 pat-test-safety-bradford.com works along side all businesses large or small to ensure their portable appliance testing and inspection is carried out with visual inspection including checking plugs and fuses and cables are safe, we replace any defective plugs or fuses and IEC leads. Earth continuity test and insulation test along with a leakage test if needed. Complete with pass/ or fail label on the appliance, log sheet and certificate of compliance. We cover Bradford and West Yorkshire areas and can also provide you with Health and Safety advice and Training of your employees and Managers, our course is a Health and Safety induction course presented via power point with certificate. This promotes a positive Health and Safety culture within your workplace with refresher training if needed.